Want to rejuvenate the appearance of your smile? Your dentist in Columbia, TN can help you take the years off your teeth with professional teeth whitening. Dr. Goodman offers both in-office whitening and take-home whitening for a brighter, more beautiful smile in just about 14 days! 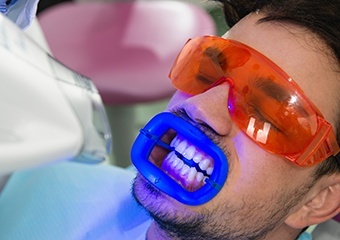 Your teeth don’t look as bright as they once did, but why? Our teeth are naturally bright because the enamel, or the outer layer, is made of white calcium. Of course, some people are just born with brighter teeth than others. The shade of the teeth typically matches the whites of the eyes. Over time, however, frequent exposure to dark foods and beverages gradually darkens the smile. Combine black coffee, red wine, and other highly pigmented items with less-than-perfect dental hygiene, and your smile is likely to lose its luster rather quickly. While you can take certain preventive measures to keep your teeth whiter for longer, there is no way to absolutely prevent them from darkening with time. Nothing ages your overall appearance like a dingy smile. Fortunately, professional teeth whitening helps you regain your white smile safely and quickly. With a custom-fitted professional teeth whitening treatment, you can enjoy brighter teeth in just about two weeks. Unlike white strips and other treatments you find at the pharmacy, a professional treatment is created specifically for your mouth. That means it fits perfectly, holding the whitening gel right up against the tooth enamel for maximum whitening. To begin, you will visit our office for the creation of your custom trays. You can begin treatment as soon as you receive your personalized trays. Simply fill each tray with the high-powered bleaching gel and wear for the prescribed amount of time -- usually about half an hour each evening or in the morning. You will begin to notice whiter teeth after the very first treatment, but you should complete the system to reveal the brightest results. It goes without saying that you will want to keep your teeth white for as long as possible after completing your whitening treatment. People who maintain good habits and excellent dental hygiene are likely to enjoy their bright smiles for many years to come. Some patients don’t ever feel the need to repeat teeth whitening. Keep your teeth whiter for longer by avoiding the things that caused them to stain in the first place, like red wine, black coffee, tobacco, and poor dental hygiene. Taking a sip of water between drinks of dark beverages can help to reduce staining. Likewise, eating crusty bread or crunchy vegetables along with red wine and dark beer can naturally scrub away the agents that cause stains. Keep up with your six month visits to the dentist to prevent the buildup of plaque and tartar for a smile that’s as healthy as it is beautiful! Get started with professional teeth whitening and you can enjoy a brighter smile in two weeks or less. Contact the “dentist near me” in Columbia -- schedule an appointment with Dr. Goodman today!